Dweezil Zappa (born Ian Donald Calvin Euclid Zappa; September 5, 1969) is an American rock guitarist and occasional actor. He is the son of musical composer and performer Frank Zappa. Exposed to the music industry from an early age, Dweezil developed a strong affinity for playing the guitar and producing music. Able to learn directly from guitarists such as Steve Vai and Eddie Van Halen, Dweezil released his first single (produced by Eddie Van Halen) at the age of 12. In addition to writing and recording his own music, Dweezil has carried on the legacy of his father's music by touring with the group Zappa Plays Zappa. The band features renditions of Zappa's original material and the lineup has often included Zappa alumni such as Napoleon Murphy Brock, Steve Vai, Terry Bozzio and others. Dweezil Zappa was born in Los Angeles California to Frank Zappa and Gail Zappa. He is the second of four siblings: his older sister, Moon, younger sister Diva and younger brother Ahmet, and is the cousin of actress Lala Sloatman. Zappa's father was of Sicilian, Greek, Arab, and French descent, and his mother was of French, Irish and mostly Danish ancestry. Dweezil's registered birth name was Ian Donald Calvin Euclid Zappa. The hospital at which he was born refused to register him under the name Dweezil, so Frank listed the names of several musician friends. "Dweezil" was a nickname coined by Frank for an oddly curled pinky toe of Gail's. At the age of five years, Dweezil learned that his legal name was different, and he insisted on having his nickname become his legal name. Gail and Frank hired an attorney and soon the name Dweezil was official. In the 1980s, Zappa worked as an MTV VJ and was promptly fired after badmouthing MTV on The Howard Stern Show. He also recorded some solo albums, as well as playing for other artists. Zappa can be heard playing lead guitar on the Fat Boys' "Wipe Out" (1987) and can be seen in the music video for Don Johnson's top 40 song, "Heartbeat". He also played co-lead guitar (along with Reb Beach) on Winger's cover of Jimi Hendrix's "Purple Haze". He also had a part in the futuristic Arnold Schwarzenegger film The Running Man as Stevie ("Don't touch that dial! "), and gave his most famous cameo role in John Hughes's Brat Pack film, Pretty in Pink (starring Molly Ringwald), as Andie's friend, Simon. Since the early 1990s, Zappa has been working on a piece of music named "What the Hell Was I Thinking? ", a 75-minute piece featuring guitar solos by dozens of famous guitar players. The project has suffered from numerous difficulties and has been reworked several times since the '90s. Dweezil said in September 2004: "I started recording it on analog tape almost 13 years ago... There are probably about 35 guest guitar players on it, everybody from Brian May to Eddie Van Halen, Eric Johnson, Angus and Malcolm Young—it's quite a crazy project. I'm still waiting and hoping to record Jeff Beck and Jimmy Page as some of my final guests on there." In the mid-1990s, Zappa voiced the character Ajax Duckman on the animated series Duckman. He also briefly appeared in the television sitcom Normal Life with sister Moon Unit Zappa and former Laverne & Shirley star Cindy Williams. He composed and performed the theme music for The Ben Stiller Show (the solo from Spinal Tap's "Break Like the Wind"). In 1998, Zappa played music agent John Kaplan in the Warner Bros. family comedy Jack Frost. 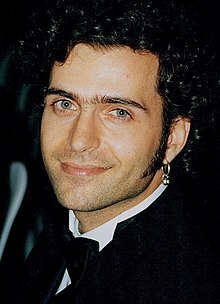 In 1999, Dweezil, alongside his brother, Ahmet Zappa, starred in a show featuring celebrities, bands and dance troupe called Happy Hour which debuted April 3, 1999 on the USA Network. The show lasted for one season despite its success due to a copyright dispute over the title of the show. Dweezil Zappa performing on the "Zappa Plays Zappa" tour in 2006. In "Weird Al" Yankovic's 2003 eleventh studio album Poodle Hat, Zappa performs the opening guitar solo and sings on the track, "Genius in France". In 2006, Zappa organized the "Zappa Plays Zappa" tour. He assembled a band of young musicians with a view to bring the music of Frank Zappa to a younger audience. The tour also featured guest appearances by Steve Vai, Napoleon Murphy Brock and Terry Bozzio. The tour began in Europe in May with dates in the U.S. from June. After a break it continued in the U.S. on October 18, 2006. The 2007 version of the tour ran from July, finishing in Australia in early December, and featured Ray White as special guest. The shows ended with the promise: "There are so many songs we want to learn to play ... see y'all next year ...", and further tours have followed each year since 2007. In 2009, Ray White left Zappa Plays Zappa for an undisclosed reason. Zappa lent his voice to one of the characters in one episode of Metalocalypse on Adult Swim. In 2016, Zappa went on tour to celebrate the 50th anniversary of the release of Frank Zappa's album Freak Out!. The tour was titled "50 Years of Frank: Dweezil Zappa Plays Whatever the F@%k He Wants – The Cease and Desist Tour". The tour title was inspired by Zappa's feud with his brother Ahmet over the use of the "Zappa Plays Zappa" moniker, which resulted in Ahmet sending Zappa a cease-and-desist letter through the family trust. From 1998 to 2004, Zappa dated musician Lisa Loeb. Zappa and Loeb wrote and performed music together, and Zappa toured with Loeb's band. The couple co-hosted the cooking show Dweezil & Lisa on Food Network in 2004. Zappa married fashion stylist Lauren Knudsen on September 3, 2005 in Los Angeles. They have two daughters: Zola Frank Zappa (born 2006) and Ceylon Indira Zappa (born 2008). In March 2010 Knudsen filed for divorce in L.A. County Superior Court. According to the documents, she cited irreconcilable differences and applied to share legal custody of the two daughters. In March 2012, with the divorce case still unresolved, Zappa's former lawyer made a public issue of his unpaid legal bills. Dweezil went on to marry Megan Marsicano in a private ceremony in Los Angeles in April 2012. Following the death of Zappa's mother, Gail, in October 2015, it was revealed that his siblings Ahmet and Diva were given control of the Zappa Family Trust with shares of 30% each, while Dweezil and his sister Moon were given smaller shares of 20% each. As beneficiaries only, Moon and Dweezil will not see any money from the trust until it is profitable—in 2016, it was "millions of dollars in debt"—and must seek permission from Ahmet, the trustee, to make money off of their father's music or merchandise bearing his name. Zappa received a cease-and-desist letter from the trust after he announced that he was being forced to perform his upcoming tour as "Dweezil Zappa Plays Frank Zappa" instead of using "Zappa Plays Zappa." In response to the trust’s action, he renamed his performance series "50 Years of Frank: Dweezil Zappa Plays Whatever the F@%k He Wants—the Cease and Desist Tour." Gibson Roxy SG - a replica of a guitar played by Frank Zappa on tour and in the studio during the '60s and '70s, the original Roxy SG can be seen depicted on the Roxy and Elsewhere album cover. Gibson produced a limited run of 400 Roxy SGs, featuring custom electronics and Maestro vibrola tail piece. Dweezil has used his own Roxy during Zappa Plays Zappa tours. 1984 – Guitar on Frank Zappa's You Can't Do That on Stage Anymore, Vol. 3 (album) on "Sharleena"
1986 – Guitar on Don Johnson's song "Heartbeat"
1986 – Guitar solo on "Whipping Post" on Frank Zappa's Does Humor Belong in Music? 1988 – Winger on "Purple Haze"
1990 – Opening and outro solos on Extreme's Pornograffitti on the song "He-Man Woman Hater"
2000 – Guitar on Dixie Dregs's California Screamin CD performing "Peaches en Regalia"
2001 – 9.11, on "Top of the World"
2003 – "Weird Al" Yankovic's Poodle Hat album, on "Genius in France"
2004 – Lead guitar on "Time Heals" on Todd Rundgren's "Hello, It's Me And My Friends"
2005 – Guitar on "Surf Punks" on the soundtrack to the game "Conker: Live & Reloaded"
^ "Dweezil Zappa World Bio". Retrieved 2015-06-25. 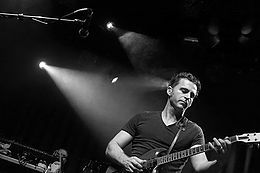 ^ "Dweezil Zappa Biography (1969-)". Filmreference.com. 1969-09-05. Retrieved 2013-09-03. ^ "Lala Sloatman at IMDB". Retrieved 2014-02-09. ^ Miles, Barry (2004). Zappa. Grove Press. p. 124. ISBN 0-8021-1783-X. ^ These were the names of Frank Zappa's musicians and associates Ian Underwood, Don van Vliet, Calvin Schenkel and Euclid James "Motorhead" Sherwood; see "What are the names of Frank Zappa's kids?". Retrieved 2007-08-06. ^ a b James, Daniel (September 2004). "Dweezil Zappa: 64-bit Computing & The Frank Zappa Archive". Sound on Sound. Retrieved 2008-02-20. ^ "Tour Dates". Zappa Plays Zappa. 2013-08-20. Archived from the original on 2013-09-02. Retrieved 2013-09-02. ^ "Ray White Leaves Zappa Plays Zappa". Kill Ugly Radio. Retrieved 2013-09-02. ^ a b c d Randall Roberts. "It's brother and sister against brother and sister in bitter fight over control of Frank Zappa's legacy". www.latimes.com. Retrieved 2017-03-25. ^ Edler, Molly Snyder (2007-06-17). "Dweezil and Frank reunite in "Zappa Plays Zappa"". Archived from the original on 2008-06-15. Retrieved 2008-02-20. ^ Zappa, Dweezil (2008-06-06). "On the road again/Dyna Flangers". Archived from the original on 2011-09-27. Retrieved 2009-04-13. ^ "Lauren Knudsen Leaves Dweezil Zappa: Pictures". Zimbio.com. Retrieved 2013-09-03. ^ "Dweezil Zappa Sued By Lawyer". Gossip.whyframe.com. Retrieved 2013-09-03. ^ "Dweezil Zappa Bio". Dweezilzappaworld.com. Archived from the original on 24 April 2012. Retrieved 17 July 2012. ^ a b Levy, Frank (July 2012). "Dweezil Zappa". Guitar Player. pp. 42–46. ^ "Gibson Roxy SG Description Page". Retrieved 2015-06-25. ^ "Dweezil Zappa: F.O.H. 3 – Out Of Obscurity". 11345.com. 2012-11-10. Retrieved 2013-09-02. ^ NOTE: although recorded 12-23-84, the above version of "Sharleena" was first released as a 7" flexidisc in the January 1987 issue of Guitar Player magazine. ^ "Extreme II: Pornograffitti CD Album". Cduniverse.com. Retrieved 2013-09-03.